Moteuczoma, the last king who ruled the Aztec Empire, was rarely seen or heard by his subjects, yet his presence was felt throughout the capital city of Tenochtitlan, where his deeds were recorded in hieroglyphic inscriptions on monuments and his command was expressed in highly refined ritual performances. What did Moteuczoma's "fame" mean in the Aztec world? How was it created and maintained? In this innovative study, Patrick Hajovsky investigates the king's inscribed and spoken name, showing how it distinguished his aura from those of his constituencies, especially other Aztec nobles, warriors, and merchants, who also vied for their own grandeur and fame. While Tenochtitlan reached its greatest size and complexity under Moteuczoma, the "Great Speaker" innovated upon fame by tying his very name to the Aztec royal office. 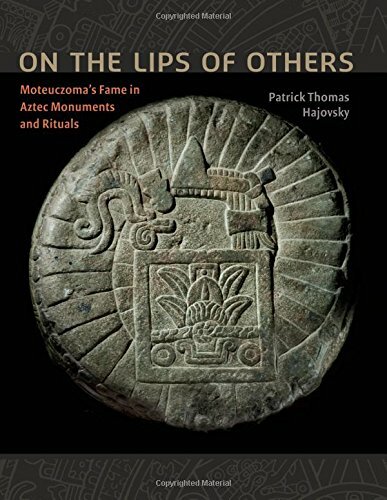 As Moteuczoma's fame transcends Aztec visual and oral culture, Hajovsky brings together a vast body of evidence, including Nahuatl language and poetry, indigenous pictorial manuscripts and written narratives, and archaeological and sculptural artifacts. The kaleidoscopic assortment of sources casts Moteuczoma as a divine king who, while inheriting the fame of past rulers, saw his own reputation become entwined with imperial politics, ideological narratives, and eternal gods. Hajovsky also reflects on posthumous narratives about Moteuczoma, which created a very different sense of his fame as a conquered subject. These contrasting aspects of fame offer important new insights into the politics of personhood and portraiture across Aztec and colonial-period sources.